Millions have seen their video on YouTube, now the "Hand Dancers", Up & Over It are bringing their act to Rach's kitchen table - literally! Catch them on the "Rachael Ray Show" for a bit of brand new handograpahy - 'citing! Fed up of the same old Irish Dance shtick? Bored of the velvet-clad, tin-whistling-blowing, diddly-idleness? Ever dreamed of a place where two seasoned professional Irish Dancers mix it up with electro-pop, nouveau folk and video? 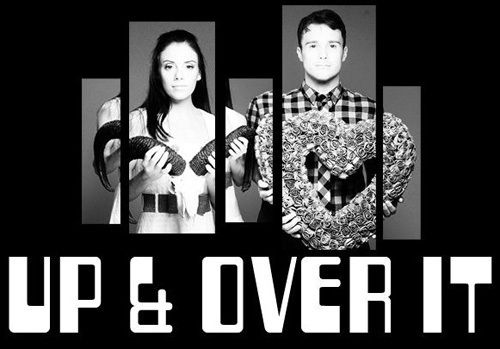 Then look no further...A collaboration between Suzanne Cleary, Peter Harding and Jonny Reed, Up & Over it aims to stretch the concept of Irish Dance to its limits. Who are Up & Over It? Up & Over It is Suzanne Cleary, Peter Harding (performers and choreographers), and Jonny Reed (creative director and video artist). Peter and Suzanne choreographed and shot a McDonald’s advert, which is really exciting. “We No Speak Americano” has gotten 3 million hits on YouTube. Now at over 3.2 million hits on YouTube, the video has been seen on TV in the U.S., Germany, Australia, India, and France, and they are just the ones we know about. They like to use music that they enjoy listening to and inspires them to dance — that’s why there’s a lot of electro-pop in their work! Sometimes you stumble across something and immediately want to come up with a concept for it; other times you’re working on a piece and have to really dig to find the right piece of music. They want to play with people’s perceptions and misconceptions of Irish dance by commenting on issues that are relevant today. They want to offer a broad experience and create work that is entertaining and challenging. The work is inspired by video art, pop music, contemporary art, and dance. The post-pop generation is those who are too old to be fanatics but too young to be connoisseurs. We appreciate art, but it must be fun.